In Ancient Christian Wisdom, I mention the fact that “Saint Anastasius of Sinai once observed that man differs from beast by virtue of his ability to consider, to decide, and to will, thereby overruling the instinctual reactions that he shares with other living creatures.” And yet when our life revolves around feeding our passions, when our head never looks beyond the food in our trough, we don’t seem to be so very different from cattle. For in such a state, we no longer really consider the big picture, we are unable to make the right decisions, we find that our will is unstable, and ultimately, that we are not really free. Christ, however, came to change all of that, to set the captive free, and to raise us up to the Jerusalem on high. He can transform the way we live, elevate the way we think, and lead us to a world more glorious and holy than we could ever imagine. Only then are we truly the crown of creation. The beginning of freedom is loosening of our attachment to a life that looks no further than pleasures at hand and that sees no meaning beyond satisfying the self’s demands. And that loosening comes through learning the teachings of the Gospel of Christ handed down from the Holy Apostles and putting them into practice in our day-to-day life by hungering for righteousness rather than fodder, by looking at the world with pureness of heart rather than a self-serving mind, by making peace with others, rather than stirring up strife, by having mercy on other others, rather than demanding what we think is our due. And when we live in this way of obedience to Christ’s commandments, the King of Glory rests upon us and leads us beyond the dank stable that was our home to a new heaven and a new earth in terms of how we feel, how we think, and how we behave. Anything that touches Christ and His teachings can be restored to the pristine beauty of God’s creation and drawn to the ultimate aim of Holy Providence. 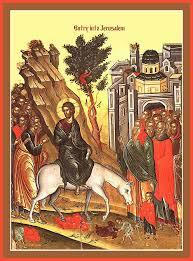 The dread Cross becomes the life-giving Cross and a small donkey a symbol of what is possible for us if we are obedient to the Lord. Everything that makes us who we are, our strengths and even our weaknesses, can be used in the service of Christ and His glory as long as His gentle hands hold on to the reigns. Holy Week, beginning with the raising of Lazarus, is a week of divine condescension, ineffable humility, and kenotic love. Having considered, decided, and willed from all eternity the salvation of humanity, Christ chooses to enter Jerusalem on a donkey, He allows His betrayer to scheme and offer Him up to the authorities for money, He washes His disciples’ feet, and finally He ascends His cross as the ultimate act of love for all of His children. In doing so, He purifies our own faculties for considering, deciding, and willing. He makes us not only fully human, but through His resurrection, He makes us far more than human, immortal sons and daughters of the Highest. Father John Romanides has written that we must know Christ in this life in order to commune with Him in the next. If that is to happen, we must imitate His own self-emptying love by forsaking our desires and our passions in this life in order to know Him. And if washing the feet of our brethren, offering oneself up to an angry mob, remaining silent when accused, praying for the forgiveness of those who hurt us, and giving every bit of strength we have in the service of love even to the point of death—all seem to be far beyond us. Let us at least begin as that colt of a donkey, allowing Christ to be seated upon us and to guide us in the way that we should go.